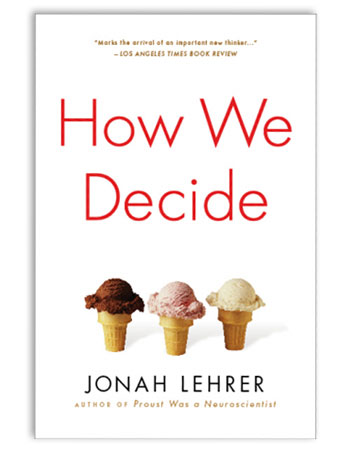 Slightly off topic, but just to plug Jonah Lehrer’s new book, How We Decide, a look at the inner mechanics of our decision-making process; as it happens, I’ve blurbed the book — but lest you suspect that is purely some corrupt log-rolling at work, I don’t actually know the author. One of my favorite bits involves some recent neuroscience work on the nucleus accumbens, “a crucial part of the dopamine reward pathway,” says Lehrer; in other words, if you own one of something and acquire another, the NAcc won’t see much activation. But getting that first thing — something one craves — well then it’s on fire. A-ha! I always wondered why I felt so oddly weak in front of the 48-packs of California pitted olives. I was still lusting after that 64-inch Sony Bravia! It always did strike me as a bit of a disconnect why there were laptops and such (which I never buy) directly at the entrance; as if to suggest, well, I’m really here to buy bulk garbage bags but maybe what I actually want is… a Dell notebook. Or I suspected they put that stuff before the staples because you might not otherwise reach that area (like the way supermarkets stuff milk at the very end of the store), or your cart would already be filled with tube socks and toothpaste, with no room (actual or psychic) for luxury goods. But I like Lehrer’s theory that it’s like Costco’s version of a kind of mental stimulus package, a bit of Keynesian pump-priming — I develop an instant crush on the TV, and this unrequited romance makes me fall harder for 55-gallon-drum of Chi-Chi’s salsa ten aisles further on (and that also seems like such a more virtuous and rational purchase to boot). In any case, the book is filled with similarly fascinating excursions into the human decision-making apparatus, in all its imprecise glory. Comments Off on How We Decide. Click here to leave a comment. A wrong-way driver caused a crash that killed two adults and a boy early today and left a teen-age girl critically injured. The wrong-way driver’s history of driving trouble goes back years. Shana Alexander, a spokeswoman with the Missouri Department of Revenue, recited a long list of administrative actions to convictions in court. He has a 1994 conviction for excessive blood alcohol; a 1995 conviction for driving while intoxicated; a 1997 conviction for driving while suspended or revoked; a 1997 conviction for DWI; and a 2001 conviction for driving while revoked. The most serious one, the 1997 DWI conviction, was out of St. Louis County. This is the unfortunate reality with traffic enforcement. Even if you stiffen the penalties, you can’t physically restrain someone from getting behind the wheel (outside of putting ignition interlocks on every vehicle). Unless, of course, they’re in jail, where this criminal must now surely be heading, albeit too late. Comments Off on Road Recidivism. Click here to leave a comment. 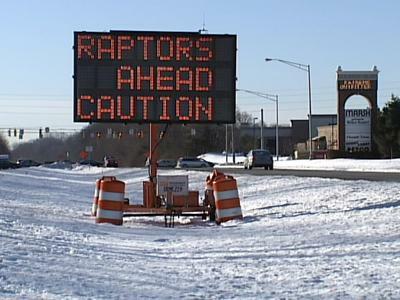 I’ve seen signs on small churches in the South that warned the Rapture was coming, but I’ve not yet seen a “Raptors ahead” warning. What began with Texas zombies, then moved to Nazi zombies, has apparently become a nationwide phenomenon, with Indiana drivers being warned of some unseen hawk presence. Well, defensive driving lesson number one is: Expect the unexpected. Comments Off on Don’t Fear the Raptor. Click here to leave a comment. Germany’s trying to stimulate its economy by giving new car buyers a $2500 Euro for junking their old car in exchange for a model that meets the latest emissions standards. The new car need not be German. One wonders if there’s an interesting long German word for this program. Not everyone is convinced the plan from Chancellor Angela Merkel’s government is best for the car industry or the environment. Ferdinand Dudenhoeffer, a professor of automotive economics at the University of Gelsenkirchen, said Merkel’s move was little more than a political gift to the car market and predicted only 20 per cent of the new cars sold would be from German companies. “One could say the wreck premium is an economic program for the factories in Italy, France, eastern Europe and Korea. For workers in Germany, the bonus will contribute little,” Dudenhoeffer said. Comments Off on Germany’s Wreck Premium. Click here to leave a comment.